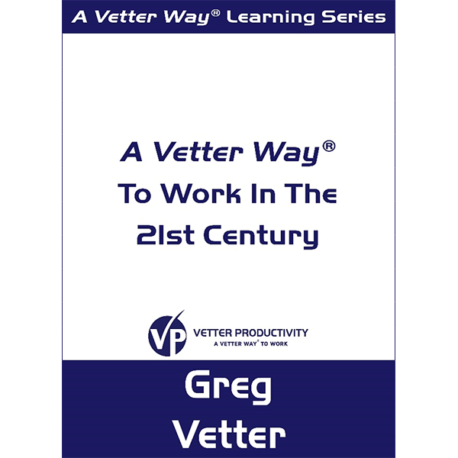 Work In The 21st Century | Vetter Productivity, Inc. This is the complete, unabridged workbook that Greg Vetter uses when he leads his nationally recognized two-day workshop, A Vetter Way® To Work in 21st Century, for companies including IBM, Morgan Stanley, and The Coca-Cola Company. 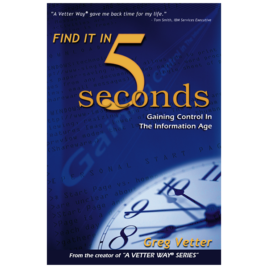 This workbook is for you if you are ready to eliminate the frustration of information overwhelm and create a system you will learn to depend on and appreciate for the amount of “found” time and energy Vetter’s method guarantees. 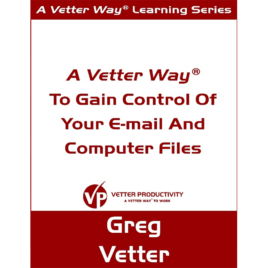 Every concept and step to set up the best organizational system in your computer, e-mail and file drawers is included. 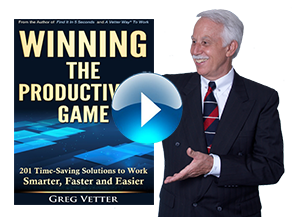 A simple, proven method for your filing system, your desk and your office is clearly illustrated in steps you will be able to follow and accomplish. You will create an information flow using a unique process with your e-mail, and one with your paper. Finally, you will know exactly what you can throw away and the easiest way to make decisions about what to keep. 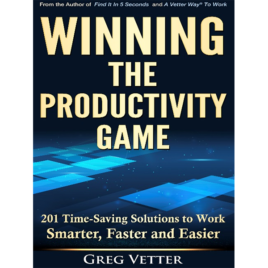 You will learn four new ways to work, time-saving e-mail shortcuts and techniques, how to empty your desk Inbox in less than five minutes, and the only five items to keep on your desk. This also includes a Glossary, review questions and answers, and a step-by-step section on how to set up your electronic and paper systems.